Geographical Range: Native to Cuba, they are commonly found in southeastern Florida, Jamaica, and the Carribean. Habitat: Knight Anoles are commonly found under shady areas of trees. They prefer a warm and humid climate. Diet in the Wild: They eat grubs, spiders, medium to large sized insects, tree frogs, and moths. In captivity they can be fed crickets, earthworms, smaller lizards, and pink mice. 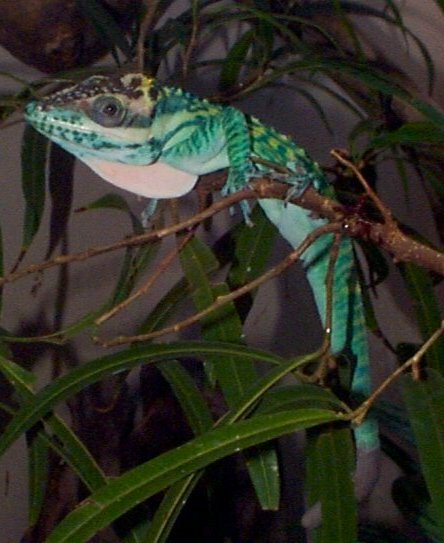 Physical Description: The Knight anole is the largest Anolis species in the world. They grow in length from 13-19 3/8 inches. The head is large and bony, and their eyes can move independently. They have strong jaws and sharp teeth. The tail is often longer than the entire body and has a jagged upper edge. They have special adhesive lamella on their five clawed toes that allow them to stick to surfaces making it easier for them to run. This adhesive pad is located on the central part of each toe. Their body is covered with small granular scales with two white or yellowish stripes below each eye and over each shoulder. They are a bright green color, which can change to a light brown with yellow markings. Their color change depends on their mood, temperature, or other types of stimuli. Yellow areas may appear and disappear around the tail. Males are usually larger than females and have a pale pink throatfan that balloons up when excited. Social Organization: They are the most active during the day and are generally very calm and shy. They do not have the ability to produce any sounds. Since they are territorial, they can be violently defensive when threatened. Their behavior during breeding season may be significantly different than outside of breeding season. Males will become more aggresive towards other males and will display their throatfan much more. A dominant male may develop black spots on his head, which is a sign of his dominance. The subordinate males will leave these dominant males alone. However, two dominate males closely together may lead to a fight for territorial rights. 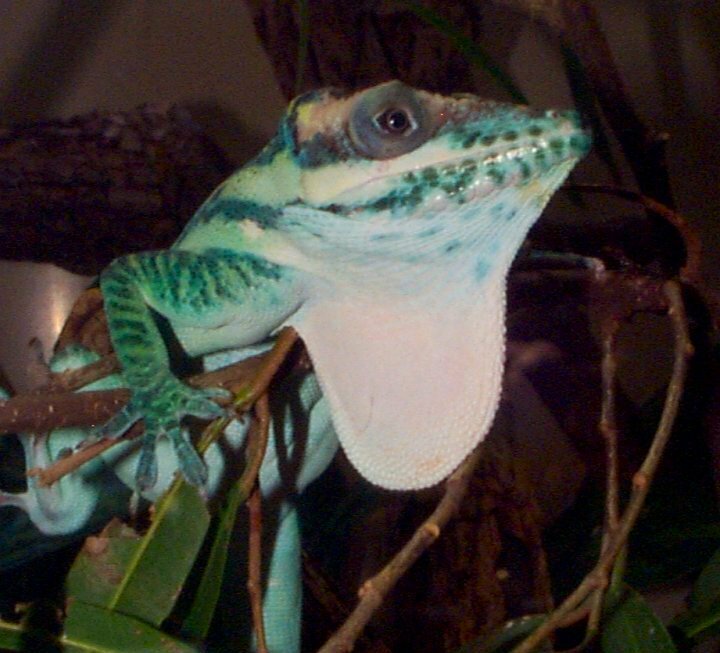 Special Adaptations: The special adhesive toe pads allow the Knight anole to run up smooth vertical surfaces, downwards horizontally, and even upside down. Also, color changes help the Anole blend in with their environment providing camouflage for both predator and prey. If an Anole should lose its tail, it has the ability to regenerate a new one. However, a new tail is never the same as the original in size, color, or texture. 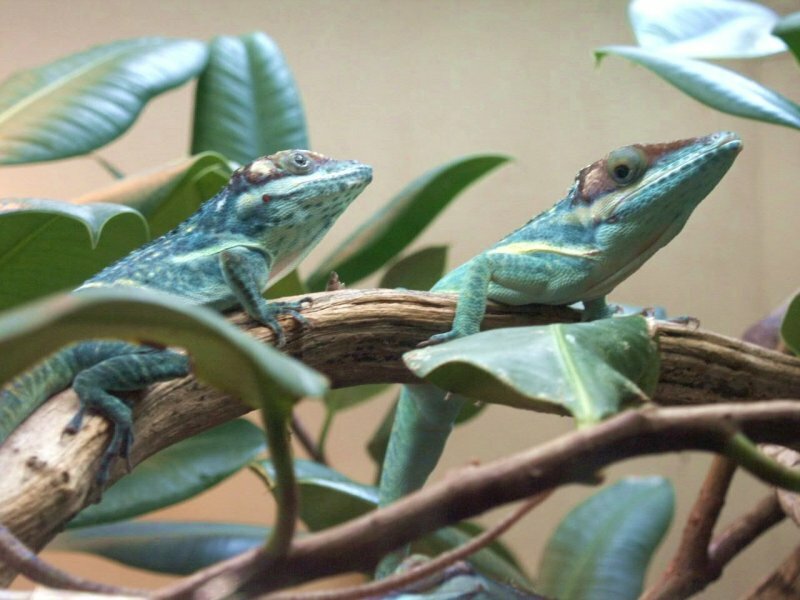 Reproductive Behavior: Knight anoles are egg layers and average breeders. Breeding occurs during the spring and summer months. When courting, the male starts bobbing his head rapidly and turns towards the female to display his throatfan. He then grabs the female by the neck. In order to start mating, the male will force his tail underneath the female to bring their cloacas in contact. Sometimes males will try to mate with other males because of their inability to distinguish a male from a female. The Animal at the Zoo: The Knight Anole was introduced to the Fort Worth Zoo in 1993, and was brought over from Guantanamo Bay, Cuba. Knight anoles are not very active at the zoo.